Absolute and relative direct pen interaction. (a) absolute hovering: the cursor tracks the pen tip; (b) absolute dragging: cursor directly under pen tip; (c) relative hovering: cursor does not track (a “clutching” operation); (d) relative dragging: pen controls movement of cursor from a distance. 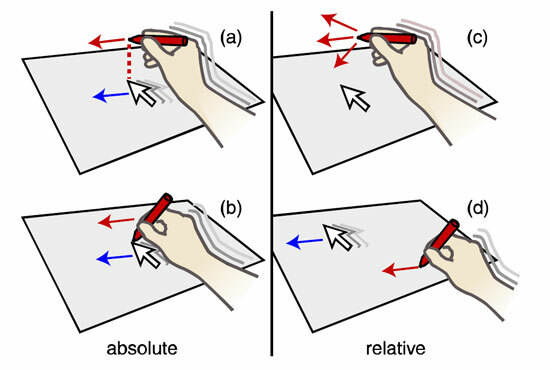 HybridPointing is a technique which enables quick switching between absolute and relative pointing with a direct input device such as a pen. Our design includes a new graphical element, the Trailing Widget, which remains "close at hand" but does not interfere with normal cursor operation. The use of feedback to aid understanding of input state is an important component and several visual and audio aids are presented. An experiment conducted on a large, wall-sized display validates the benefits of Hybrid- Pointing under certain conditions and we also discuss other situations in which HybridPointing may be useful. Finally, we present an extension to our technique that allows for switching between absolute and relative input in the middle of a single drag-operation. Forlines, C., Vogel, D., & Balakrishnan, R. (2006). 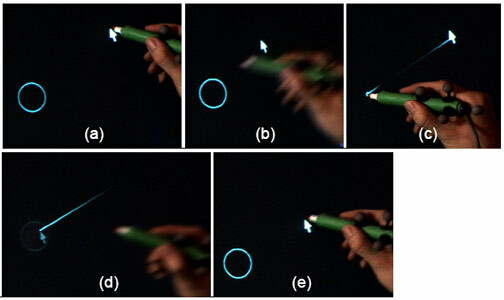 HybridPointing: fluid switching between absolute and relative pointing with a direct input device. Proceedings of the 19th annual ACM symposium on User interface software and technology (pp. 211-220). Montreux, Switzerland: ACM.